TikTok, formerly known as Musical.ly, is one of the most popular live streaming and video sharing apps that lets users create short videos and funny lip sync clips. Sometimes you may come across interesting videos that you want to save to your Android phone for watching later or sharing with friends. 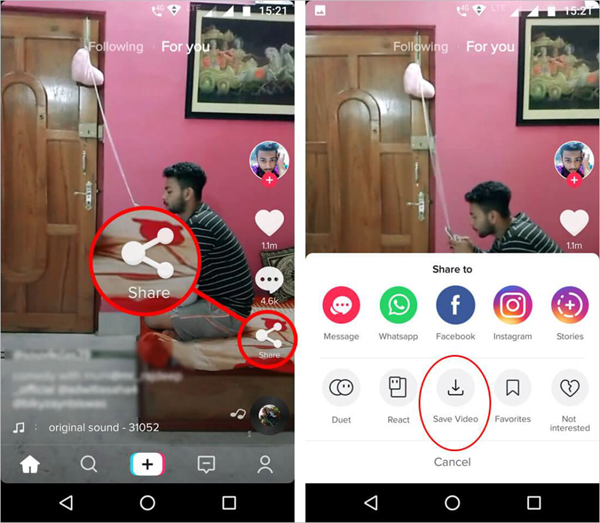 Thankfully, you can straightly download TikTok videos to Android smartphone with its built-in video saving option. In addition to this, there are a number of ways that can help you complete the TikTok video download task. We shared how to go live on TikTok on Android device earlier. In this article, we will introduce you 3 different ways to save TikTok videos on Android phone without any hassle. One thing to note, you’d better to have the permission of the content creator before you download their videos and share their work. TikTok has a built-in video saving option that allow its users to easily download videos from inside the app. Please note, whether you can download depends on the audience settings of the video. If the account owner has switched off the saving video option in their profile and kept the video downloads for friends only, then this method won’t work. Open the TikTok app on your Android device and go to the video that you want to download. Click on the Share option on the right-hand side corner of the screen. You will see a “Save Video” option if it’s a public video. Click on the Save Video option and the video will be saved to your Android phone’s gallery. Other issues with this method are that watermark will be added to the downloaded videos and you can only download one video at a time. If you mind these, you can try the following methods to download TikTok videos on your Android device. If you don’t get the video saving option for your favorite videos, don’t worry, another method to save TikTok videos is using third-party apps. There are many apps on the Google Play Store that provide straightforward way to download videos from TikTok to your Android device. Here we recommend Video Downloader for TikTok. It is very simple to use. All you need to do is paste the link and download the video. Open the TikTok app and locate the video you want to save. Tap on the Share option and then choose “Copy Link” to copy the video link to clipboard. Install and launch the Video Downloader for TikTok app, and paste the copied link to the address bar. Now tap on the “Download” button and wait for the download process to be completed. If you don’t want to install any third-party downloader apps on your Android phone, there is another way to save TikTok videos. 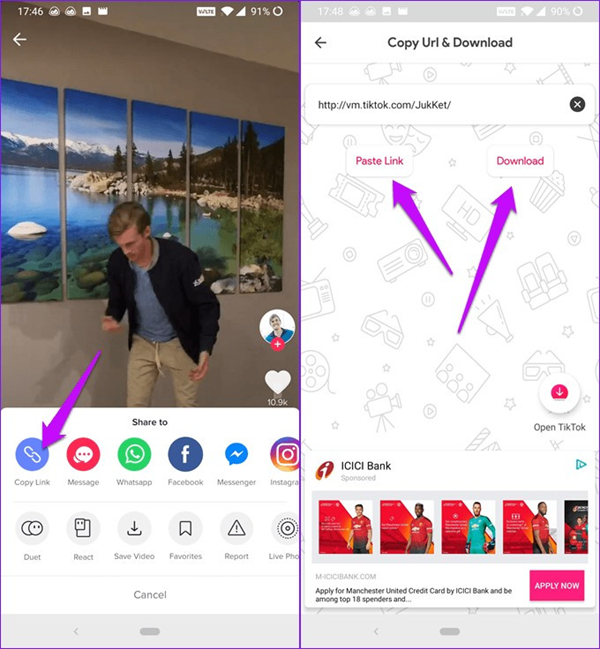 The TikTok’s Share menu also features the email option, which enables you to send a video to yourself or to a friend via email. 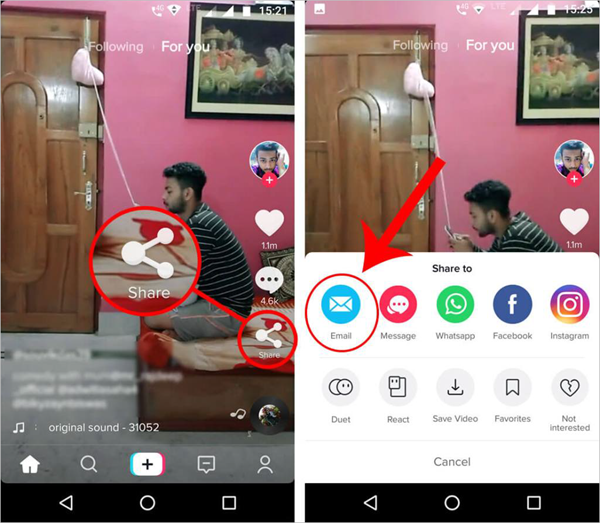 Also, you can share the TikTok videos to Message or other apps like WhatsApp, Facebook, Instagram and then save them with ease. Open the TikTok app on your Android device and select the video you want to send. Simply click on the Share icon from the right side of the screen and you will find the “Email” option. Click on the Email option, the app will save the video and open the Email service on your Android phone, and attach the video as an MP4 file. Send that email to yourself or someone, and then go to your email account to save the video to your Android phone. Here are the top 3 ways that works for downloading TikTik videos on your Android device. Once you’ve saved the videos to your gallery, you can watch them whenever you want or share on WhatsApp, Instagram, Facebook and any other social media apps. If you want to download YouTube videos from computer, we recommend Gihosoft TubeGet. It is very simple to use. All you have to do is to copy and paste the URL, and the program will do all for you.